Spending time together as a family is often considered one of the most rewarding parts of any given day for the average American. Whether it’s eating dinner together or watching a movie side-by-side, enjoying an activity daily can help develop and grow the family bond. As one of your home’s most important rooms, your kitchen is the perfect place to bring your loved ones together for some bonding time. However, many kitchens aren’t as well-equipped for family fun as they could be. Keep your little ones safe and refresh your kitchen’s appearance by redesigning the heart of your home with your family in mind. Teaching your children how to cook is both fun and useful. Cooking together can improve your bond and give your children a new appreciation for the food they eat. Unfortunately, many kitchens aren’t equipped to make cooking or baking a family activity. Kitchen islands with built-in stoves can give your kids a better view of the action and more room to gather round. Though children should always be supervised around stoves, letting your little one stir a sauce or ask questions about cooking is educational and bond-forming. With the kids spending more and more time in the kitchen, you’ll also need to prepare for the inevitable spills and accidents. Even something as simple as rolling out dough can quickly turn your countertops into a sticky, dirty mess. Cleaning and protecting your countertops doesn’t have to be complicated, though! 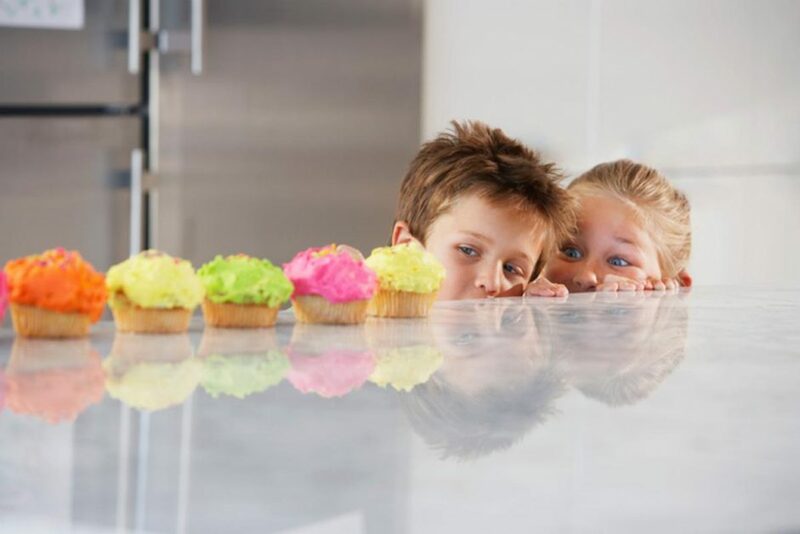 With low-maintenance counter materials like quartz or Corian®, you can rest assured that your kiddos won’t damage your counters with spills, stains or cracks. No sealing or maintenance required. Kids are naturally curious and inclined to help their parents. While this behavior is heartwarming and sweet, it can sometimes lead to dangerous situations. Rethink your kitchen’s storage system and consider if your children may be able to access cabinets that are storing potentially harmful items such as alcohol, knives or glass. These cabinets should be locked at all times. To promote your child’s independence in the kitchen, though, it’s a good idea to store kid-friendly items in lower drawers where little hands can reach them. Giving your kids access to their plastic plates, utensils, and cups allows them to show off their independence. Young children may struggle to help in the kitchen because of their height. Consider lowering the counters and installing counters with rounded edges to allow them access to countertop activities without the danger of hurting themselves on a pointed corner. Cook with Your Kiddos in Your New Kitchen! 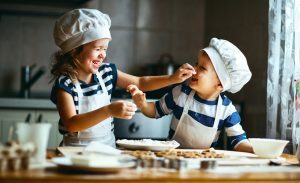 Bonding over cooking in the kitchen is a wonderful way to develop a great relationship with your children. 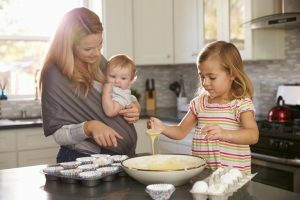 If you’re planning a kitchen remodel in your Georgia home, look to Detail Design and Remodeling for help with designing your kid-friendly kitchen. 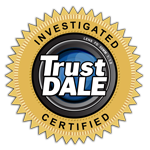 To schedule your consultation today with one of our expert designers, contact us online or call 770-379-0446.